An homage to the English country manor house is on the market in Brookville for $3.880 million. The homeowners hired architect Gary Gallagher to replicate the style both inside and out, says Andrea Kamhi of Daniel Gale Sotheby's Interantional Realty, who is listing the 1995 property with Zhaohui Xu of Winzone Realty. The two-story brick home is on two acres and has a large courtyard at the entrance. 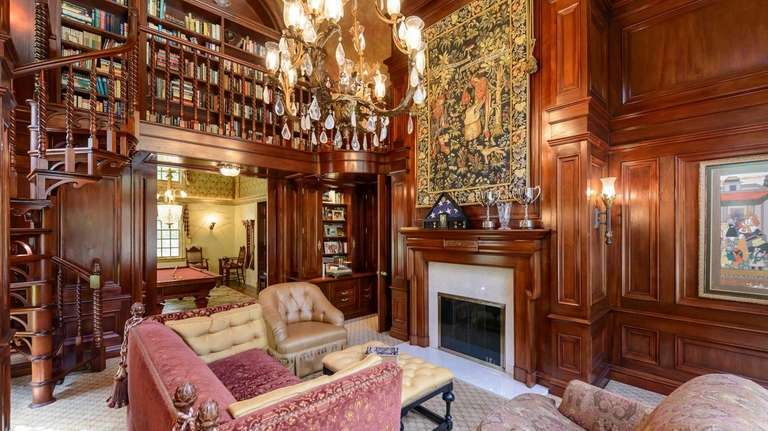 There is a library boasting floor-to-ceiling mahogany paneled walls and a spiral staircase leading to a loft of built-in bookshelves. The room also has a wet bar and a mahogany mantel over the fireplace, which does double duty: It also opens out to the adjacent great room, where it is surrounded by a rock facade. A formal dining room is decorated with a mural canvas depicting the English countryside. There are seven bedrooms, five bathrooms and one half-bathroom. Other features include an eat-in kitchen with access to an outdoor slate patio, a heated in-ground pool and an attached three-car garage.